Architects Zagrodnik + Thomas designed the nature center with the intent to increase awareness and education of both the nature preserve and the environment. The project allows visitors to appreciate and understand the importance of coastal wetlands and its wildlife. The 5,600 square foot building includes an exhibit room, park rangers’ office, multipurpose room, restrooms, storage, large observation decks and a gathering area. To get the USGBC LEED “gold” rating, the design includes a green roof, natural daylighting and ventilation, storm water filtering, reclaimed water, photovoltaic panels, more than 90 percent of debris from demolition and construction on the site was recycled. Some of the excavated shells were used in the Lithocrete finish. The design team took advantage of every opportunity to use natural materials and incorporate the history of the site. The end result, says Pam Slater-Price, San Diego County Supervisor, is a nature center that will “serve generations to come,” will “fit in” rather than dominate the beautiful setting, and will not impede residents’ views. T.B. Penick & Sons completed their scope of work in 3 months with an average crew of 2-3 men. The decorative concrete scope included both walls and flatwork. Visitors are first greeted by a custom 8 foot tall Lithocrete® Sedimentary Wall. The foyer features a recycled glass and shell seeded Lithocrete replica of the lagoon and sedimentary seat walls. 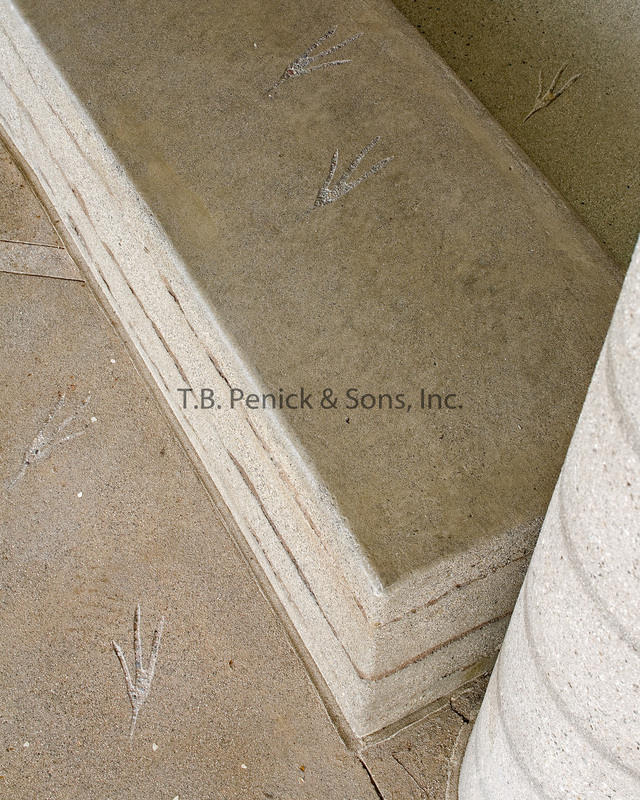 Other features of the project are custom bird feet stamps going in and out of the restrooms and sandblasted indigenous leaves and bird’s feet on the flatwork and tops of seat walls. The interior of the building features radiant heating underneath the shell-seeded concrete floor.